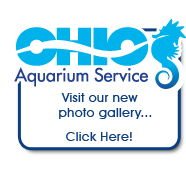 Ohio Aquarium Service is Central Ohio's premier provider of quality care and maintenance of freshwater aquariums, saltwater aquariums, and ponds. Whether you have an existing pond or aquarium, or are considering a purchase, Ohio Aquarium Service can provide you with products and services which ensure your aquarium or pond is both healthy and beautiful. Working in either your home or office environment, we develop a flexible maintenance schedule that fits both your needs and lifestyle. Our customers also have access to our 24 hour emergency phone line should an emergency requiring the assistance of a specialist arise. Regular service and maintenance makes having an aquarium or pond both easy and more enjoyable. To learn more about our services, and to read answers to frequently asked questions, visit our FAQ page. We encourage you to look around our website and to contact us or call us at 614-849-8400.